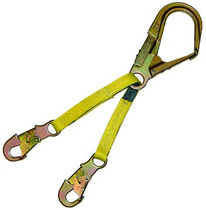 These positioning and restraint lanyards have been designed to be used while tying rebar or constructing concrete forms. 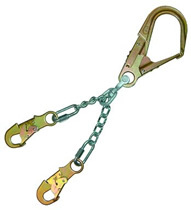 Models are available with or without swivels, and are made of 5/0 twist-link zinc plated chain or 1" wide polyester wide polyester webbing. RW22LZN - 22" long, # 3100, snaphook, no swivel.